Why it’s necessary to look beyond the bold type on the package and go straight to the Nutrition Facts panel. There is a hot new marketing trend in the food industry: simplicity. A slew of products in grocery stores are boasting that they contain just a few simple, all-natural ingredients. 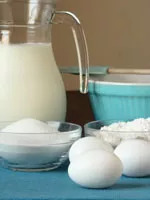 Problem is, those "simple, all-natural" ingredients are generally things that provide little nutritional value for their number of calories—and they include sugar, cream, flour, salt, oils, and butter. I figure anytime a processed packaged food product markets the brand with squishy terms like simple, all-natural, naturally sourced, or wholesome, it’s necessary to look beyond the bold type on the package and go straight to the Nutrition Facts panel. After all, if the product was qualified to make any real Food and Drug Administration–approved nutrient claims (such as, it's rich in calcium, low in sugar, or high in fiber), then it would. Instead, many are using feel-good marketing terms that may make unsuspecting consumers think that the products might, well, be good for them. And it's not like I have a personal vendetta against simple foods; most things I eat are whole foods with few artificial ingredients. But that doesn't mean that anything without chemicals or hard-to-pronounce additives makes my list. Here are three of the best examples of “simple” marketing that reveal a more complex nutritional picture. This new ice cream brags that it's "crafted with only five ingredients for incredibly pure, balanced flavor…and surprisingly less fat!” The ingredients for the ginger flavor include: skim milk (good), cream (not so good), sugar (eek! ), and egg yolks (not great). A half-cup serving has 230 calories, 12 grams of fat, 7 grams of saturated fat (that's more than one-third of your daily limit), one-fourth of your daily cholesterol allotment, and 5 1/2 teaspoons of sugar. According to the brand marketers, these refrigerated gems “are made with the simple, wholesome ingredients you and your family know and love.” These ingredients are well known, yes, but not for being nutritional all-stars; they include refined wheat flour, sugar, eggs, chocolate chips, and peanut butter. I love a good cookie, but I don’t try to pass my homemade creations off as something nutritionally superior that I can feel good about eating. A puny 1-ounce serving of the Simply…Chocolate Chip variety will set you back 150 calories, and it has 8 grams of fat (3.5 grams of saturated fat) and 3 teaspoons of sugar. But there's no appreciable fiber, whole grains, vitamins, or minerals, and that’s no nutritional bargain compared to other chocolate chip cookies. At least frozen desserts don’t give any aura of health and wellness, so I’m going to give them a break. Anyone buying a frozen apple or cherry pie isn't thinking about diet quality or calories. In fairness, what’s so simple about these desserts is that they go from freezer to perfect-pie-on-your-plate in five minutes. But a slice of cherry will still deduct 330 calories from your bank, not to mention the 16 grams of fat (about one-fourth of what you should have in a day) and 6 teaspoons of sugar. How about including more truly natural, single-ingredient foods in your shopping cart the next time you visit your local retailer? Here is what's on my shopping list today.